DUBLIN, GA -- Navy vet Connie Willhite, cancer-stricken and dying, had just two small requests. He wanted to be baptized to ensure he'd cross over to the next life in accordance with his religious beliefs. And he wanted to go on one more fishing trip. The baptism wasn't a problem. A Veterans Affairs chaplain performed the ritual. The gear wasn't a problem. His cousin got the fishing tackle. But there was one tangle in the line: Because of his advanced colon cancer, Willhite had to remain bed-ridden. His caretakers weren't going to let that stop them. "We can't do a lot about the quantity of days you have but we can do a lot about the quality," said Greg Senters, a social worker at Carl Vinson VA Medical Center in Dublin, Georgia. Senters arranged to get a mobile motorized hospital bed and the fishing trip was on. Behind the hospice unit at the VA center is Lake Leisure. 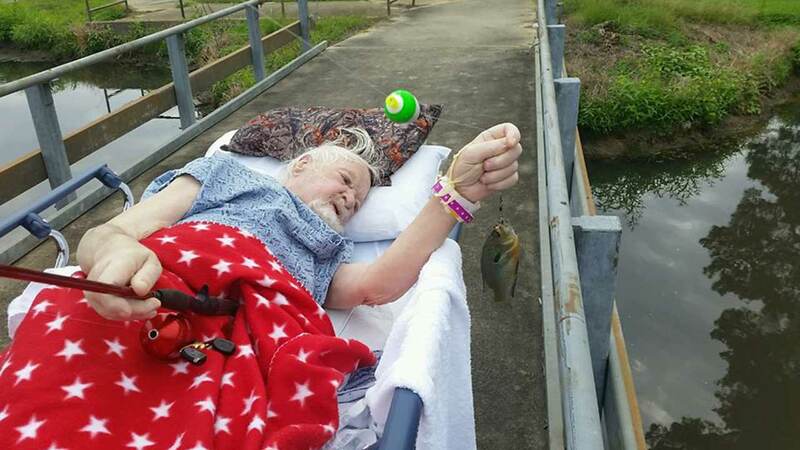 For the next few hours one day last month, the Vietnam vet was "gone fishin.'" Willhite didn't even care if he caught anything. Fishing is not catching, he told Senters. But Willhite was a great fisherman in his day, his family will tell you. And even at a frail 68, he was still pretty good. He caught four bream, about the size of an adult hand. "A dying person can teach you a lot about living," Senters told CNN. "Sometimes we get so caught up in the day to day we forget about what's important." Three days later, Willhite died peacefully.